The final Republican presidential debate before primary voters in 11 states cast their ballots on Super Tuesday dissolved into an unseemly brawl in which candidates competed with each other to be the loudest and sling the most insults at each other. With an avalanche of putdowns, zingers and crass insults, Senators Ted Cruz and Marco Rubio tag-teamed on Donald Trump to question his conservative values and his character, with Trump returning the favor in the Republican debate held Thursday in Houston, Texas. 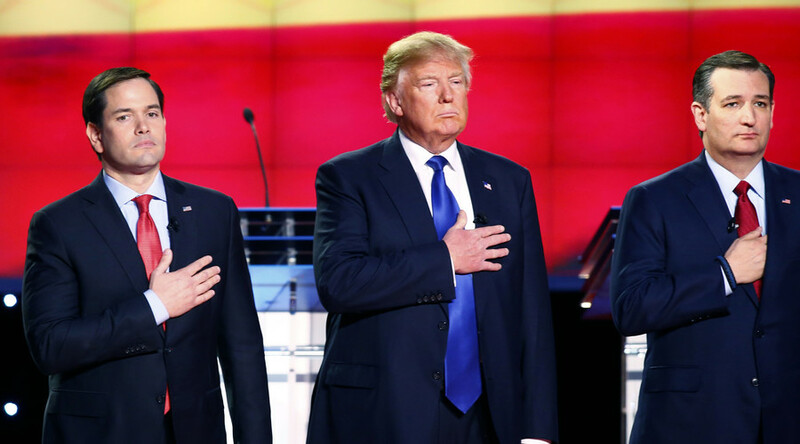 Tweets characterized the Republican debate brawl as a fight between light and dark. Rubio accused Trump of repeating himself. Trump fought back, battering Cruz with the flawed argument that if he can't beat Hillary Clinton, Cruz certainly won't. CNN's Wolf Blitzer often struggled to control the debate and it was noticed by the audience. On topics of substance - immigration, the economy and foreign policy - the candidates used each topic to take swings at each other. Cruz criticized Trump, suggesting he had “discovered the issue of illegal immigration.” Both Rubio and Cruz said Trump had to pay a $1 million fine for illegally hiring immigrants. The accusation came from a campaign ad that ran the day of the debate put out by Our Principles, an anti-Trump Super PAC fronted by Katie Packer, a former aide to 2012 GOP nominee Mitt Romney. Cruz insisted on answering the Obamacare question and used it to bludgeon Trump. Trump stood by his position: “I will not let people die on the streets if I’m president. Let me talk. We’re going to have private health care. I am not going to let people die on the streets or the sidewalks of this country, if I am president. You might be fine with it. I’m not fine with it." All the candidates said they supported Israel, while Trump said he would not take sides in seeking peace and was attacked for that. And it's not surprising who was the biggest talker of the debate.